Bebop arrived at the Gladys Porter Zoo on March 18, 2018 from The Center for Conservation of Tropical Ungulates in Punta Gorda, Florida. As with any other animal that comes to the Zoo, Bebop underwent a 30 day quarantine period before being introduced into his exhibit. After the quarantine period, keepers began adjusting him to his new exhibit and to our resident females, Julie and Abby, by placing them in side-by-side enclosures to get acquainted. This allowed them to be able to see and smell each other with the safety of a barrier between them. On August 21st, introductions began with the youngest female, Abby. 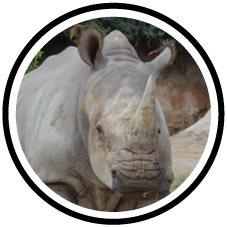 A few weeks later, on October, 24th, keepers introduced Bebop to the oldest female, Julie. All three rhinos were placed on exhibit together for the first time on October 30th, and as Zoo staff hoped, they all got along great! Zoo staff hope that Bebop will successfully breed with the females and, in turn, will produce some healthy calves. This would be a great success for the species.